Home / Restaurant Equipment / Commercial Ice Machines / Modular Ice Machines / Hoshizaki KM-340MAJ Slim Line Modular Crescent Cube Ice Maker, Air-Cooled, 404 lb. Hoshizaki KM-340MAJ Slim Line Modular Crescent Cube Ice Maker, Air-Cooled, 404 lb. 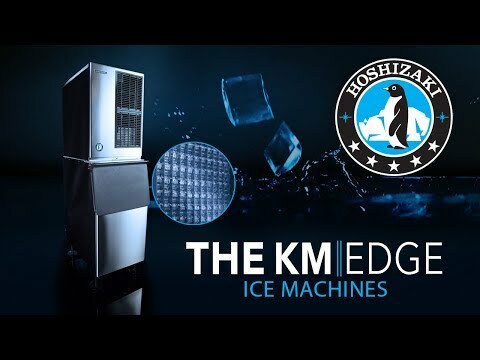 The Hoshizaki KM-340MAJ Slim Line Modular is capable of producing approximately 404 pounds of ice per 24 hours. Its efficient stainless steel evaporator creates unique crescent shaped ice cubes. This air-cooled ice maker features a CycleSaver design and includes the EverCheck alert system, making the unit energy efficient and simple to maintain. This ice maker is protected by the H-GUARD Plus Antimicrobial Agent. Unit has an ambient temperature range of 45°F-100°F, water temperature range of 45°F-90°F, water pressure of 10 - 113 pounds per square inch gauge and voltage range of 104 - 127 volts. You can mount 2 units side-by-side for 2 times the ice production in the same floor space! The self-contained ice maker is compatible with the following bins and dispensers (sold separately): B-250, B-300, B-500, B-700, B-800, B-900, B-1150, B-1300, DB-130H, DB-200H, DM-200B.